lol, ya gatta just love all the construction going on during the summer don’t ya. Should be relaxing the first 5 minutes! Ouch. That’s gotta be painful. Okay, my first thought was “But surely they wouldn’t pour concrete over him!” Then sense kicked in and I realised “Oh, it’s just a joke. Okay then.” Then I felt a little silly. Biff doesn’t have to get up. He has no responsibilities, no obligations, no deadlines and he doesn’t have to go anywhere else. There’s a bright side to everything! Isn’t that always the way?.. getting nothing but abuse when you came in for an argument! Why was he on a lawn chair inside a square hole? Was it for the shade? Of course it was, I mean…shade is an essential resource. Besides, that concrete probably felt really good when they were pouring it over him. Nah, I say it’s the low places. I don’t think one person here would give up the chance to sleep in the lowest possible place. Just something about low places makes ’em seem comfortable and sleep-worthy… Am I right or am I wrong? I thought he fell asleep and sunk into the concrete. As in It had already been laid, but still not dry. Mafioso: Give us da specs for your “breader” machine, or else we’ll give you concrete PANTS! The worst part for Biff at this point is he mite need a new pair of shoes. He would have no trubul getting out of the side walk. … What if he had to go to the bathroom? Ze awnser iz Simple! Biff must now convince a small german sheperd to run in circles for a half an hour while he sings “row row row your boat” backwards! 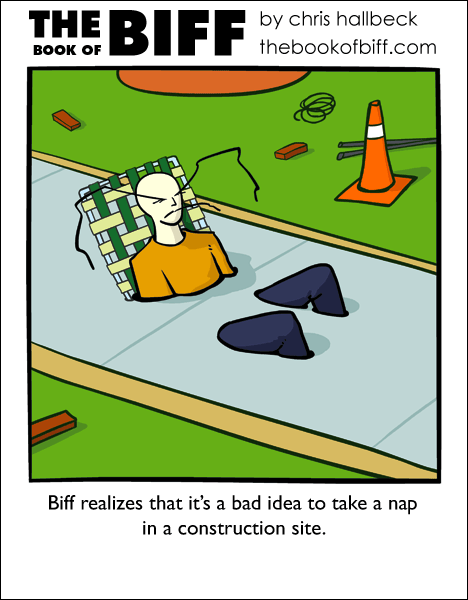 This would create a time eversion thus allowing Biff to slip out of the concrete while it was still wet. Simple. These still are some of the best comics I’ve seen. Good job. I wonder if it was done by the same folks who filled his pool with cement that one time to protect his savings. Wet concrete gives you a chemical burn. Seriously. lol this reminds me of what we did to one of my friends… he passed out after a long night of drinking, so we took him outside and taped him to a brick wall next to the callege campus…. great fun. Come to think of it…We duct-taped my best friend to the wall at a party. We only let him down 4 hours later when he had to go to the bathroom. Our town’s falling apart. All the construction around here is more like keeping a house together with chewed gum and rubber bands. At least it wasnt molten steel. That would leave a mark, or rather wouldnt.